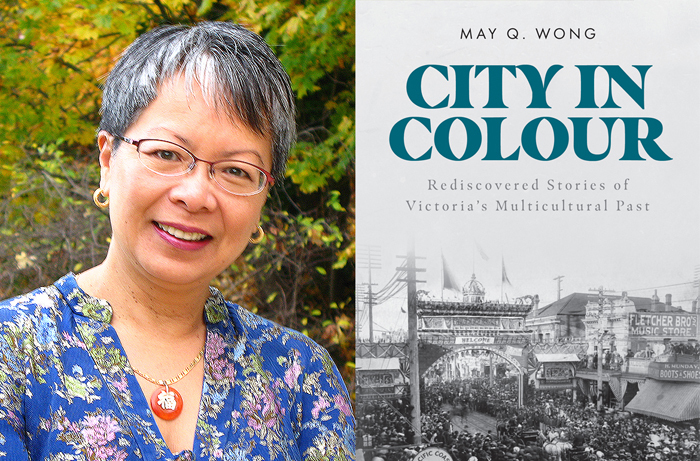 May Q. Wong will be sharing some of her research into Victoria's early cultural diversity at a Salt Spring Historical Society event on Feb. 13. The author of a new book looking at cultural diversity in Victoria’s early history will share some of her research at a Salt Spring Historical Society event at Central Hall on Wednesday, Feb. 13. Doors open at Central Hall at 1:45 p.m. and the presentation runs from 2 to 3 p.m.
May Q. Wong has been a Victoria resident for 40 years and grew up in Montreal as the child of two Chinese immigrant parents. City in Colour, her new offering, upends the truism that the city of Victoria became “more British than the British” by uncovering forgotten stories of some of the people from outside the colonial class. Wong has a natural interest in history and multiculturalism: her previous book examined the impact of the Canadian “head tax” on one Chinese family. Her decision to focus on multiculturalism in Victoria was made during a time when anti-immigrant and anti-refugee rhetoric was becoming alarmingly prolific — and not just south of the border. “I hoped the book would add a positive note to society’s growing fear and shed a light on our country’s actual cultural and ethnic diversity, and encourage the celebration and acknowledgement of all those pioneers,” Wong told the Driftwood. Victoria got its start as a Hudson’s Bay Company trading post and fort, founded in March 1843. It was incorporated as a city in 1862, but before that was already floored by newcomers from all over the world as a consequence of the 1858 gold rush. As B.C.’s celebration of Black History Month rolls on through February, it’s fitting that May devotes space to the early black settlers who came north from California. She also looks at the Hawaiians who were once found at every Pacific Northwest HBC trading post, leaving the term “Kanaka” on place names from Salt Spring Island to the Lower Mainland. There are also stories about people who came from China and Japan, as well as Jewish community members. Wong said one of the interesting things is how people of colour were treated differently. The black and Hawaiian settlers were welcomed and given full rights, while the Japanese immigrants were afforded much more respect than Chinese immigrants were before World War II — possibly because their home country was viewed as being stronger. “That’s why it’s so important to know history and understand why things happened, so you don’t make the same mistakes,” Wong said. The Indigenous people who existed within colonialism are not forgotten. Wong includes the stories of three “Métis matriarchs” who made strong contributions to the new colony. Wong explains Amelia Connolly Douglas was famous for her generosity, her skills as a midwife, and teaching her children about their Indigenous heritage. She married James Douglas, who would be governor of the Colony of Vancouver Island and the first governor of the Colony of B.C. Isabella Ross, the first female land owner in the colony, Josette Work, an HBC wife, are also featured. Wong said although the women tend to be forgotten, their husbands’ success in HBC roles was supported by their marriages. Wong’s use of primary sources includes research with the Salt Spring Archives, the BC Archives and the municipal archives of Victoria and Esquimalt. Stories from books, journals and newspapers of the time period helped inspire direction. The Jewish Museum & Archives of British Columbia was another great resource, she said. Generally speaking, in all her chapters Wong wanted to include not just the “high and mighty” settlers and people who may have been a bit notorious. The people who were just striving to subsist off the land also hold appeal. Wong’s book contains some names that are familiar on Salt Spring, such as Maria Mahoi, who raised a large family of Hawaiian and Aboriginal descent and settled on Russell Island; and Sylvia Stark, who was born into slavery in Missouri and came to Salt Spring with her husband in 1860 as homesteaders.